This map from carto.metro.free.fr shows the lines at Stratford. Note Temple Mills East Junction at the Northern (top) end of the map. If you go North from here, you are on the Temple Mills Branch of the West Anglia Main Line and you will pass through Lea Bridge station and Coppermill Junction before you reach Tottenham Hale station. Go South from that Junction and you pass the crossover of Olympic Park Junction, cross over the Eastern End of Stratford International station and then arrive in Platforms 11 and 12 at Stratford station. Platforms like these can generally handle four tph, as they do at stations like Highbury and Islington or Dalston Junction. But is a capacity of eight tph enough if some Stansted and Cambridge services are added to the mix at Stratford? But there may be other possibilities! On the map in this post, look at the lines to the North-West of Platform 11 and 12 at Stratford station and how they curve round the Eastfield Shopping Centre and Stratford International station. 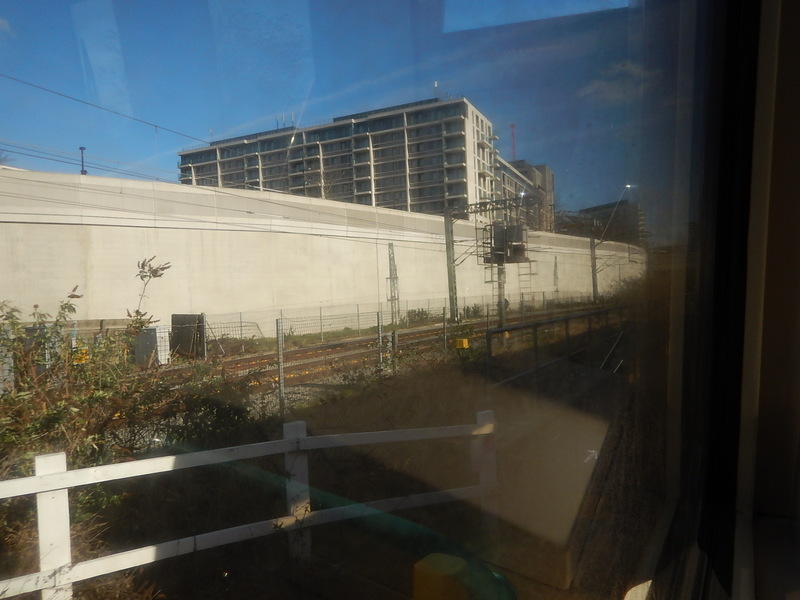 The main route is called the High Meads Loop and this picture taken from a Docklands Light Railway train to Stratford Internation station, shows the twin-track loop. Southbound trains from Tottenham Hale could do the following. Call at Platform 1 in Lea Bridge station. Call in Plastform 11 at Stratford station. Go round the High Meads Loop and past the Stratford International DLR station. Rejoin the Temple Mills Branch on the Down Line at Temple Mills East Junction. Call at Platform 2 in Lea Bridge station. The train has been turned round using the High Meads Loop, after a stop at Platform 11 in Stratford station. So do trains currently take this route? On this page in RailForums, this was said in a post made in 2006. 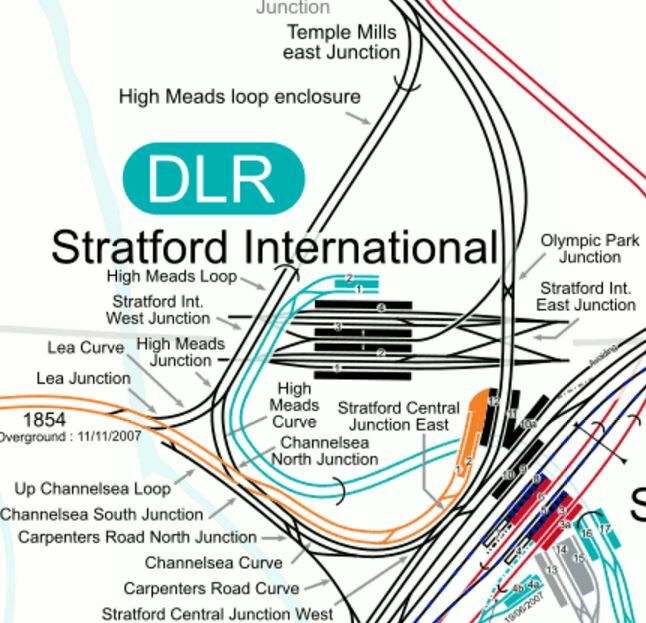 Another option is the use of Channelsea Junction and the High Meads loop to turn trains at Stratford. I’ve managed to go from Stansted Airport to Stratford and back again without changing ends using that particular route before now. I would assume from the words, the poster of the information is a driver. So they should know! Channelsea Junction is clearly shown on the map in this post. I have a few questions, that should be answered. 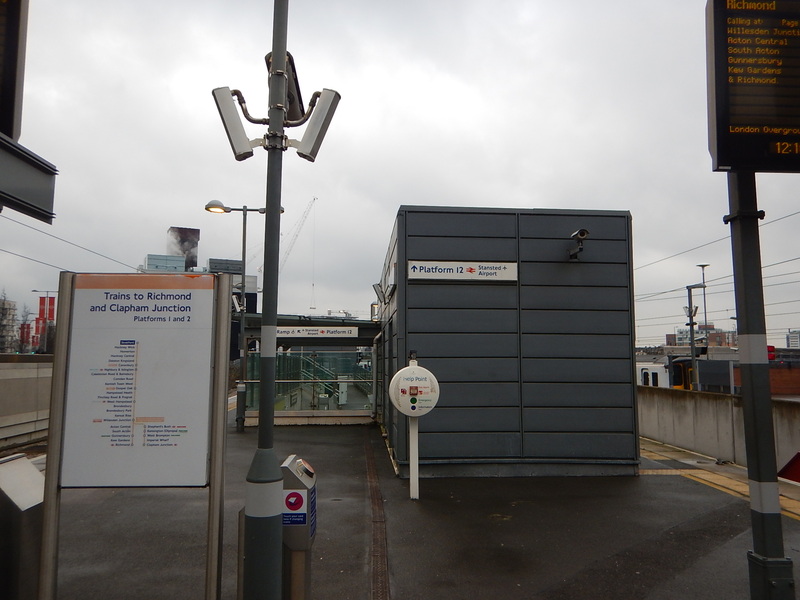 Trains stopping in Platform 12, will have a very simple step-free access to the London Overground services in Platforms 1 and 2. My personal view, would be that services using the loop called in Platform 12, as that would give me easy access from the North London Line from where I live. But going round this way through Platform 12 at Stratford would mean that trains would have to cross on the flat at Temple Mills East Junction. How Long Are Platforms 11 and 12 at Stratford? They certainly accept an eight-car train as they do now, but would they accept a twelve-car one? If they can’t and it would be needed to accept Greater Anglia’s new Stadler Flirts for the Stansted Express, there would appear to be space to lengthen the platforms, at the Temple Mills End. It has to be asked if Platforms 11 and 12 have enough capacity. I would appear that they have been built reasonably wide to accept high passenger numbers. What Services Could Use This Loop? I suspect any service arriving at Stratford from the West Anglia Main Line, that needed to be turned back, could use this route. Angel Road using the new STAR service. Chingford using the Hall Farm Curve. That is a very comprehensive list. How Many Trains Per Hour Could Use The Loop? The capacity of the loop could be at least as high as the similar Wirral Loop in Liverpool, which handles 12 tph or just one train every five minutes. Modern signalling with a measure of Automatic Train Control could probably raise this figure substantially. In addition, Platform 11 could probably handle four tph as it does now. Could A Station Be Built On The High Meads Loop To Serve Stratford International? If it could, it would ease one of London’s truly dreadful transport issues. How do you get to Stratford International station without walking a long way or going through Eastfield? Can Services Using Platforms 11 and 12 At Stratford Access The North London Line? 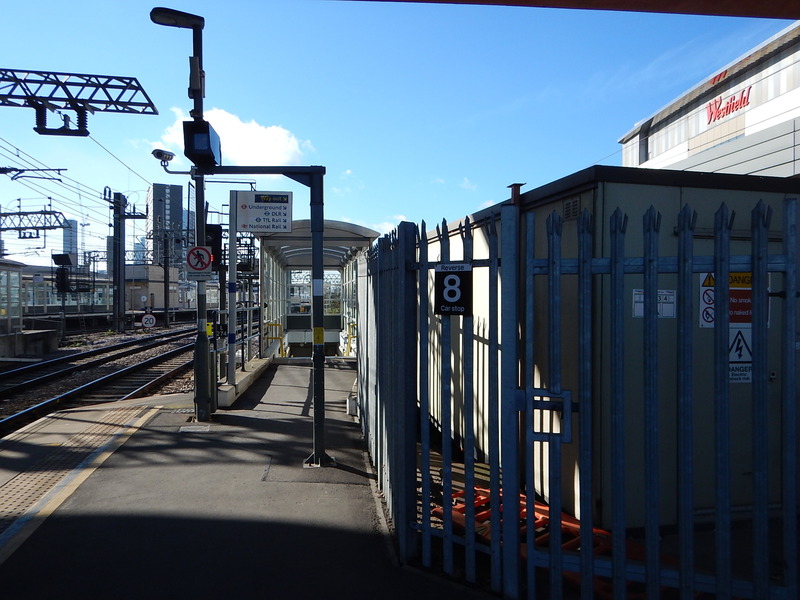 As there is a triangular junction connecting the North London Line, the High Meads Loop and Platforms 11 and 12 at Stratford, a lot of services are possible, if they are needed. But for the time being a good step-free interchange between Angel Road, Chingford and other services from the West Anglia Main Line to the North London Line services at Stratford is all that could be needed. If High Meads Loop services called in Platform 12 at Stratford, that would be an ideal solution. A short walk would connect North London Line services to Stanstead Airport services and local trains up and down the West Anglia Main Line. Note the sign in this pictuire. It directs passengers to Platform 12 for Stansted Airport services. Modern trains and signalling with a measure of Automatic Train Control could probably rise this figure substantially. So perhaps there could be twelve to fifteen tph through platform 12. In addition, Platform 11 could probably handle four tph as a traditional terminal platform. Do Any Other Services Use The Temple Mills Branch? I’m not saying they don’t, but I’ve never a freight train go through Platform 11 or 12 at |Stratford or Tottenham Hale or Lea Bridge station. But I have seen an engineering train at Coppermill Junction and empty stock needs to get in and out of Temple Mills Depot. Trains arriving at Stratford station on the Temple Mills Branch of the West Anglia Main Line can call at Stratford station and go straight back from whence they came using the High Meads Loop. One positive effect would be that however many trains went round the High Meads Loop, all could call at the following stations. A platform at Stratford International station, if it were to be built. Look at the service that Lea Bridge station gets to and from Stratford. Temple Meads is in Bristol! I knew I got Temple Mills and Meads mixed up and thought I’d edited them out.